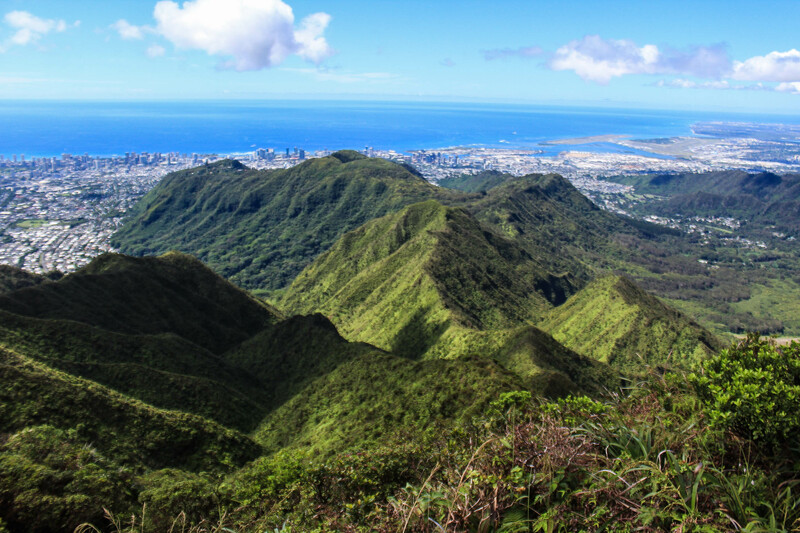 Upon moving to Oahu last year, we were met with two large mountain ranges, a long list of recorded trails on AllTrails, and all sorts of recommendations for hiking. It was all so new and uniquely beautiful and overwhelming. After a few months of living here, researching hikes, and studying maps, we decided what our biggest hiking goals were: to hike the most prominent and highest peaks on the island. This included Mt. 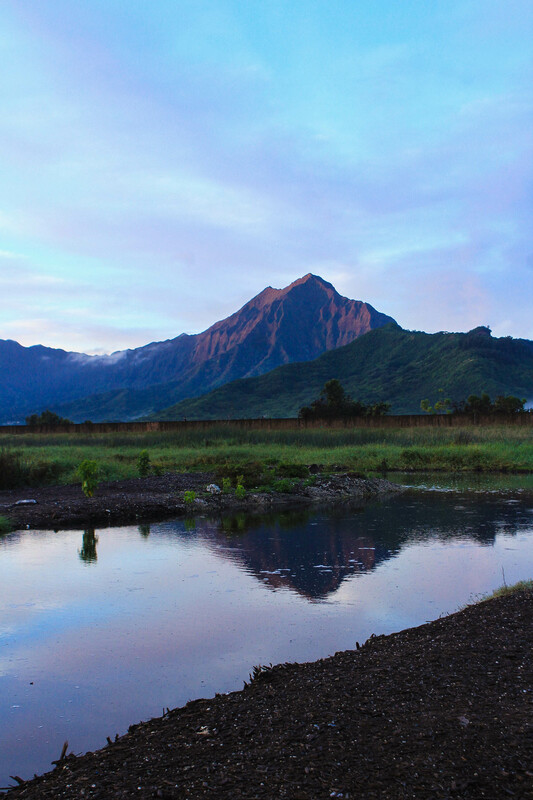 Ka’ala, the highest peak in the Wai’anae Mountains and on all of Oahu; Konahuanui, the highest peak in the Ko’olau Mountains; and Olomana, a prominent and precarious peak which stands alone on the Windward side of Oahu. Our hike up Mt. Ka’ala happened in our first month of living here. Some friends invited us to hike it with them, and I was blissfully unaware of how challenging and strenuous that hike would be. Had I known beforehand, I would have been much more hesitant to join them, but having others to hike with made me determined to finish. 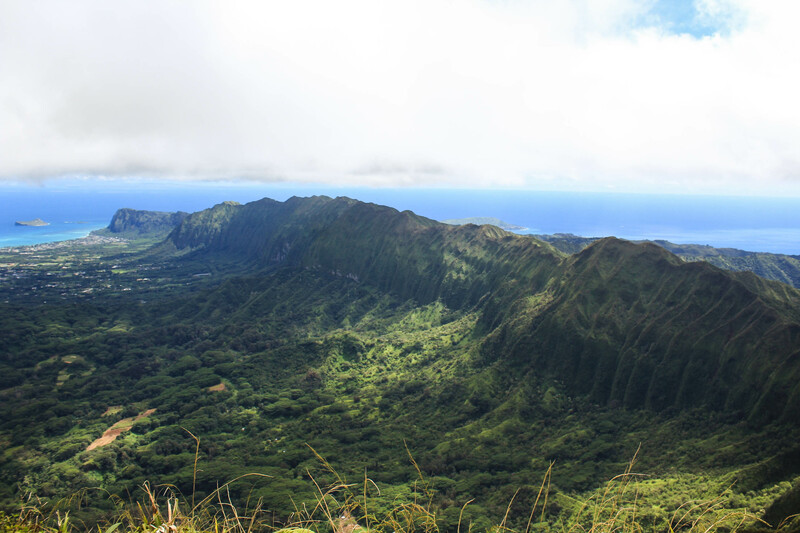 When we hiked Olomana, I was definitely aware of how dangerous it was, but we made a spontaneous decision to do so and overall that excitement and adrenaline helped me to reach the peak. Konahuanui was different. I see this mountain every single day through my kitchen window. Or rather, I see where it should be, as it was usually hiding behind clouds. It only seemed to come out on days when we couldn’t hike, and on those days I could hardly take my eyes off of it. 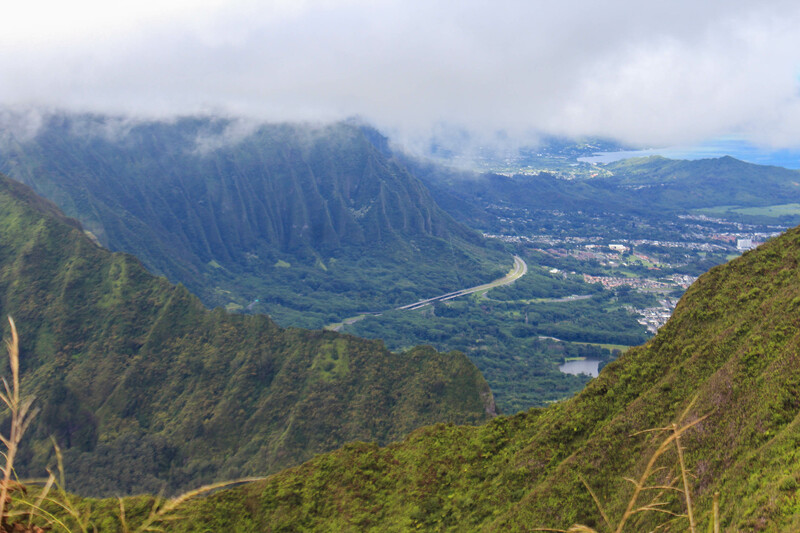 I would gaze up and wonder what it would be like to stand up there, high above the rest of the Ko’olaus. I did so much research on it, and sometimes I would read trip reports and feel as though I wasn’t ready. There were other days when I wasn’t sure I even wanted to hike it. I really believe there are peaks on this island that just aren’t meant to be hiked. But one day a few weeks ago, I began to feel strongly that I wanted to do it, and knew we needed to take any chance to do so. Thankfully we didn’t have to wait long. The morning after our last sunset adventure, I got up early and looked out the window, and there it was — completely clear of clouds. I told Curtis, who was still in bed, but he shrugged it off. We had seen it before like this — completely clear, only to be engulfed minutes later by clouds. However, an hour later I went back to look and saw that not only this mountain, but the entire Ko’olau summit was completely clear, and I couldn’t see a single cloud in the sky in any direction. I went back to wake Curtis and told him there was no way we weren’t hiking today. I threw out the idea of this hike, and we immediately started preparing. We threw together 8 liters of water, plenty of snacks, and got on the road as fast as we could. We drove to Round Top Drive, the road that goes around Mount Tantalus, to the Kalawahine Trail Head. 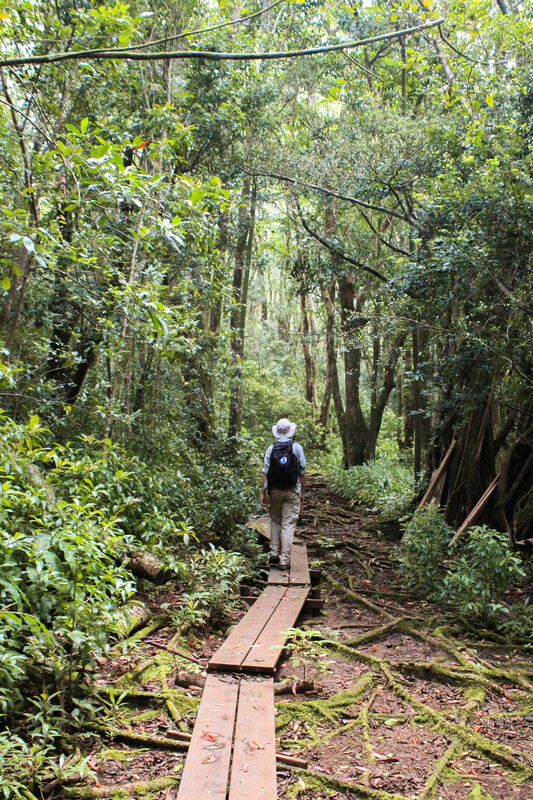 When hiking to Konahuanui via the Kalawahine Trail, there are a few significant parts of the trail that make it easy to break up and recall each section. The beginning is overall an easy and flat 2 mile walk through the woods. The second part is a mile long walk along a contour to reach the ridge. Finally there comes the exposed ridge which is also one mile and is where the majority of the elevation change happens. The whole drive over, we had marveled at how clear the skies were — both over the Ko’olaus and the Wai’anaes. However, we knew that things could still change quickly. It felt as though we were in a race to reach Konahuanui — racing clouds, rain, and heat. Thankfully the beginning of the trail is mostly flat which made it easy to keep up a quick pace. It was cool and dark under a thick tree cover. We followed a contour around the hills; the path was muddy and covered in yellow leaves and guava fruit. We passed by the trail intersection with the Manoa Cliffs Trail, one we had hiked a part of last April. After a mile of walking we met up with the boardwalk of the Pauoa Flats Trail, and accidentally took the wrong way for .2 miles before Curtis caught our mistake. Finally, we passed the junction with the Nu’uanu Trail, one we had hiked last July. 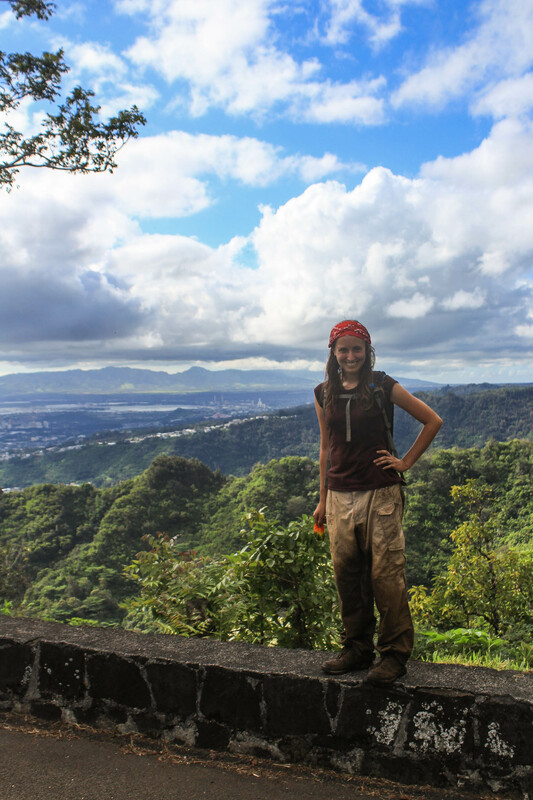 For the next stretch of trail, we retraced our steps from that hike through the muddy bamboo forest up to the lookout over the Nu’uanu Reservoir and Pali Highway. This is where the trail ends, and the real fun begins! From the bench at the lookout, we continued on a barely visible path between some trees on the right. After the initial narrow section, the trail became more obvious. We weren’t expecting there to be such a long section following the contour, and we rather enjoyed it because it kept us out of the sun. However, as we went along, we observed several parts where landslides had occurred and nearly wiped out the trail. We tried not to think about how fragile this land really was as we were carefully maneuvering the especially narrow parts. Hiking this trail would not be smart during or after heavy rain. Finally, we reached the ridge. We had seen it from a distance as we made our way closer, and no matter how close we got it still looked incredibly steep and intimidating. 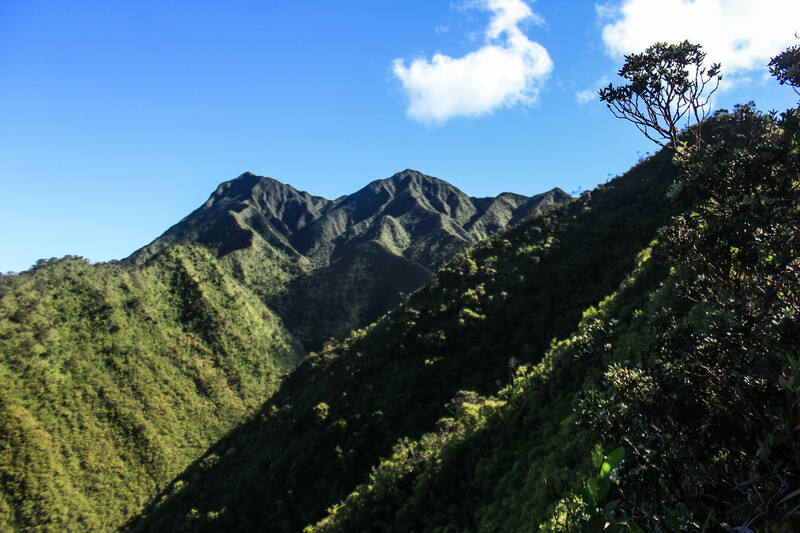 But no time to turn back, we were noticing how clouds were starting to gather to the peaks North of us and were even more motivated to push through while Konahuanui was clear. There weren’t as many ropes on this stretch as I would have liked, but there were plenty of deep ruts in the trail to help with footing. This is caused by erosion, so I know it isn’t a good thing to be thankful for… There were a few good flat areas where we could stop for a break, but we never stopped for long. The ridges ahead always looked daunting, but as long as I kept moving I was able to focus on each next step rather than the steep slopes around me. View of Southern Ko’olau Mountains from Konahunui, looking back at 6 different summits we’d previously done. We finally reached the Ko’olau Summit Trail (KST), and were greeted by the best view I’d ever seen of the Southern Ko’olaus. From here, we were only steps away from K2, the shorter of the 2 peaks that make up Konahuanui. However, these steps were by far the muddiest and most overgrown of the entire trail up to this point. We stepped out onto the summit clearing, then just stood and relished the feeling of accomplishment and the beauty that surrounded us. However, as I mentioned previously, Konahuanui is made up of 2 peaks: K1 and K2. We were standing on K2, which is about 45 feet lower than K1. I knew what came next: A half-mile long steep and treacherous mud slog down 100 feet and back up even more to the summit of K1. It wasn’t necessarily my goal to complete this, I knew I could be happy with K2. However, Curtis is a committed peak bagger, and being this close just wasn’t going to cut it. And so we began to very slowly make our way towards K1. I probably would have gone the whole way had he not given me an out. Once we reached a point on the KST where we could see all the elevation needed to be lost and gained, he told me I didn’t have to do it. And there was not a single ounce of regret in my mind as I situated myself on a very narrow spot along the trail to watch as he made his way down, up, and then back down and up. I was perfectly content to sit and watch, as well as look out and try to figure out all the other ridges we had hiked to the South. This hike had truly been a long time coming, and now here I could sit and feel proud of all we’d done to get to this point. Curtis: As far as the hike between the peaks, it was a treacherous mudslide. Unlike the hike up, the trail between the peaks was saturated with mud and although it was rutted, there weren’t any conveniently placed steps (a natural product of people hiking these types of trails). As such, the only reasonable way to get down was to sit on my back heel and use my front heel to steer as I slid down 5 foot sections of trail at a time. Normally that would be fun, right? But when there is a steep drop off on either side, it makes it less fun and more terrifying. The other side of the same coin is that on the way up the other side for every three steps up I would slide down another two. 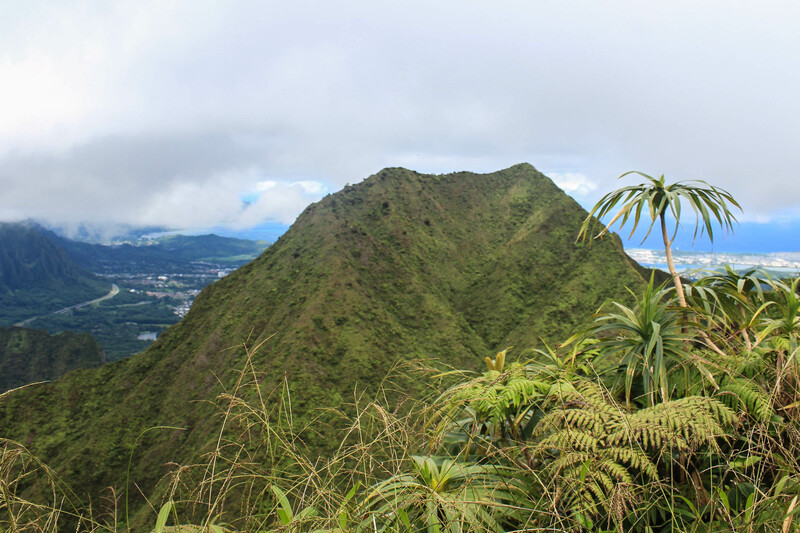 Eventually, after crawling on hands and knees up the steep incline I made it to the peak of the Ko’olaus. I ran into a group of hikers who had hiked up from the Pali Highway, a shorter but substantially steeper hike. They had plans to hike down to Manoa Falls and then shuttle back to the Pali. Not sure if Jess could see me, and afraid that she would think I had fallen off if I didn’t make it back soon, I took some pictures, admired the view and then repeated the process a second, and hopefully final time. Jess: It took him about an hour to walk the .8 miles there and back, and the first thing he said to me when he made it was “That ranks among the top 10 things I never want to do again.” He filled me in on the details of his short solo trek as we made our way back to K2 to sit down and enjoy some snacks. 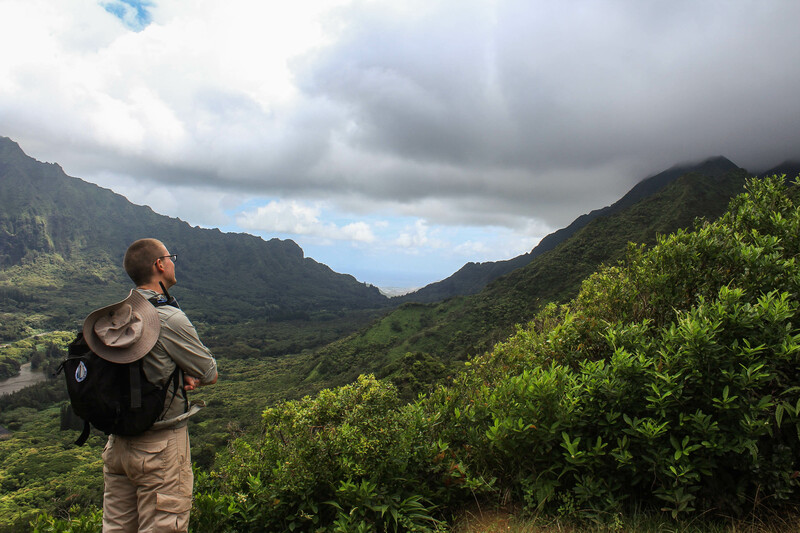 With one last look at the beautiful Southern Ko’olaus, we turned around and began our trek back. Had we been much more skilled at technical rock climbing, we could have made this into a through hike. There are several different ways to reach these high peaks, one being to start on the opposite side at the Pali Scenic lookout, climb up the Notch Trail, up the Chimney which is a vertical rock climb, followed by more steep ridge walking to reach K1, then take the trail we hiked up back down. This is what the other hikers Curtis met were doing. While I’m impressed with the abilities of those much braver and more agile than I, I am perfectly content to walk down my well-rutted ridge that seems so safe in comparison! For our way down, I strapped on my yaktraks to give extra security on the muddy trail. We took the hike down slowly and with caution as we watched clouds moving in over the peaks we had just climbed. The rain held off until we made it back to the contour trail, and we were kept mostly dry under the shelter of the trees and the shadow of the ridge. I couldn’t get over how perfect this day had been: While the skies weren’t completely clear at the top, particularly to the North, we were still able to have great visibility — we could see the outlines of Molokai and West Maui out over the ocean. It also wasn’t nearly as hot as it had been hiking Lanipo. We were tired from all the effort and miles we had already accomplished, but thankfully all that lay ahead was the easy forest walk. Altogether, it took us about 7 hours to complete Konahuanui — 8 miles to the peak of K2, and 9 for Curtis all the way to K1. We reached the Kalawahine trailhead completely filthy with mud but also giddy with excitement. If you’re interested, you can see our AllTrails recording of this hike here (Curtis’ phone died towards the end of the hike so we unfortunately didn’t get the entire thing). We celebrated by stopping by a grocery store (still in our muddy clothes) and picking up ingredients for shrimp tacos and scored a $2 cake. The Aftermath of Konahuanui: A Muddy Mess. Also, I’m wearing Curtis’ pants. It’s hard to describe what completing this hike means to me, and why it felt so significant. 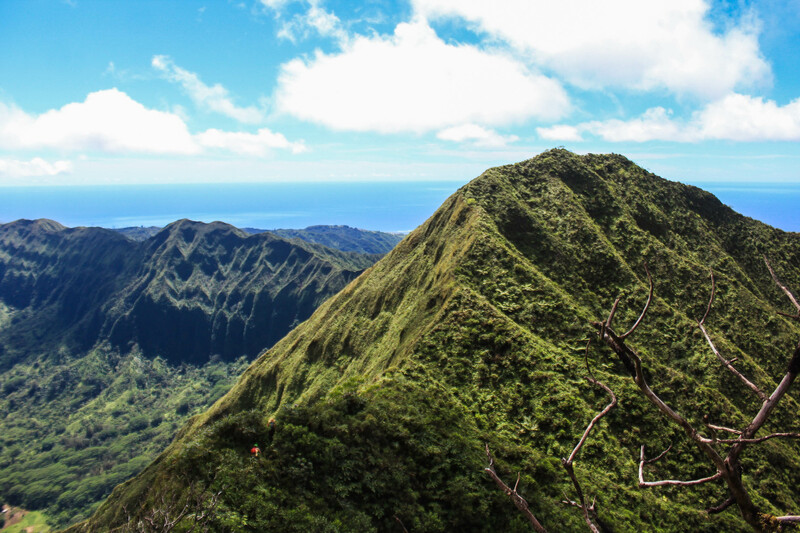 Konahuanui isn’t the highest or longest peak by any means, nor was it the most dangerous trail we’ve ever climbed. It was simply a goal we had for an entire year, a peak we wanted to climb but weren’t able to for various reasons. 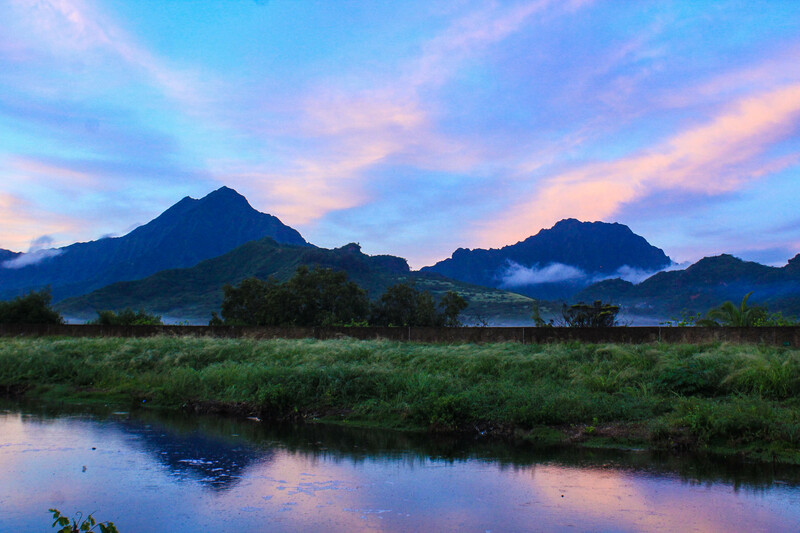 It is a mountain that I look at every day and see how prominent it is among the rest of the Ko’olau Mountains. I went through stages of doubt of whether I actually wanted to be up there on that tiny little peak where the weather can change within minutes. I didn’t know if we’d ever have the perfect day to hike it. I didn’t know if I would have the courage to do so if an opportunity ever presented itself. But it happened, we did it, and I feel an enormous amount of relief that it happened, and it’s over. Who knows, maybe in a few months I’ll want to go climb it again, but now I truly feel like our biggest goals on Oahu have been completed. If we had to leave Oahu tomorrow, we would be content with that. But we aren’t moving tomorrow — not for a number of years in fact. How will we find excitement in living here if we don’t have a major goal on this island to look forward to? I’ll admit I worried about that before completing this hike. But as we descended the mountain top and clouds started to hide the peak and fill the valleys, I realized how much of a relief this really was. No more would we have to get up and go straight to the kitchen window and look out and decide if today was the day we should hike Konahuanui. We now have the freedom to hike any old ridge we want — whether we’ve done it before or not — and not feel like we’re missing out of completing our bucket list hike. We’ve been blessed with being able to have some sort of weekend adventure almost every weekend here for a year now, but the next few years won’t look like that.